Lego iPhone app, hit, miss or maybe? – ¿¡ tjongolongo ?! Lego recently released an official application for iPhone. 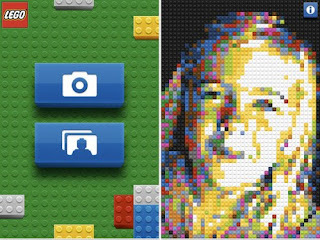 The application turns photos into a Lego mosaic, that’s it. Nothing more, nothing less. I wonder how many fans this application will get. I mean it is a nice and fun application, but personally, when I think of Lego, I think of building things with Lego bricks. I think it’s nice to see how Lego is also trying out new things in the online and mobile world, but I do wonder if this really is the way to go. If I was working for Lego I would try to built (no pun intended…) on the whole brick building thing. That’s essentially what a lot of people grew up with, building things with Lego, whether it was a car or a house or whatever, it’s the building that creating that was fun. What do you think of the Lego application for iPhone, hit, miss or maybe?